Nokia has just unveiled the Lumia 720, another great mid-range Windows Phone 8 device, with a typical Nokia unibody design coming in different vibrant colors. The Nokia Lumia 720 has a 4.3” ClearBlack LCD display with a curved glass and super sensitive touch that you can use with gloves. The design is of the pillow like, ‘human’ shape. It is 9mm thick and weighs 128g. It has a brilliant camera with extremely large aperture of f/1.9 that allows a lot of light in resulting in great low-light performance. The camera is 6.7-megapixel, with backside-illumination and auto-focus, built with a Carl Zeiss lens. It has LED flash and supports 720p video recording at 30 frames per second. There is also a 1.3-megapixel wide-angly front-facing camera. 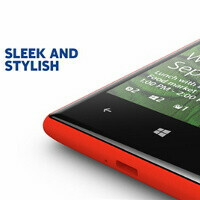 The Lumia 720 is the first Nokia phone with both a unibody design and a microSD memory extension card slot. The device will arrive in glossy white or matte red, yellow, cyan and black. Best of all, it will only cost around $330 (250 euro) off contract and support wireless charging. Expect to see it on store shelves in Q2 2013.
so htc's flagship 8x is just a midrange by nokia? Cool phone though. like it. Aside from the lower resolution display of the Nokia, half the RAM, and undefined 1 GHz dual core processor that is undoubtedly inferior to the 1.5 GHz S4 in the 8X, sure. Have you watch the lumia 620 sometimes beating the 920 in loading apps, etc? Clearblack = Cheap copy of Sammy Super Amoled Plus. Who would copy the crappy designs of your samSuck!!. Focked by fockia? Please be serious!! It was even before that! I remember C6-01 had it! yep I think it was the E7. Really? Clearblack is an old techno and it also produces pure white colors too not blue tints like we have seen on Super Lame-oled plus screen. Nokia developed ClearBlack, and even has Samsung manufacture some of its ClearBlack AMOLED displays (I believe my Lumia 900's screen was made by Samsung). Perhaps this is what Nokia was referring to when they said Samsung may be stealing ideas from the production lines? Wow. Super troll! What a horrible joke!